God could have created iceberg lettuce and called it good. Instead he created romaine lettuce, kale, collard greens, swiss chard, field greens, mustard greens and spinach – and called it all good. God is the creative mastermind behind all culinary masterpieces. He created the ingredients – the oils, spices, nuts, meats, fruits and vegetables – for His good pleasure. Then He gave man the need to consume this food to survive. In His wisdom He also gave us opposable thumbs, tastebuds and intelligence so we could prepare, partake and enjoy this food in a thousand different ways. And He designed us to partake of this abundance in fellowship with others, giving Him glory and thanks. I’m no theologian, but I’m fairly certain Adam and Eve ate together in the garden before the curse. Sharing meals was part of God’s plan. Jesus came and shared his most profound words over broken bread (and Thomas didn’t say, “No thanks. I’ll pass. 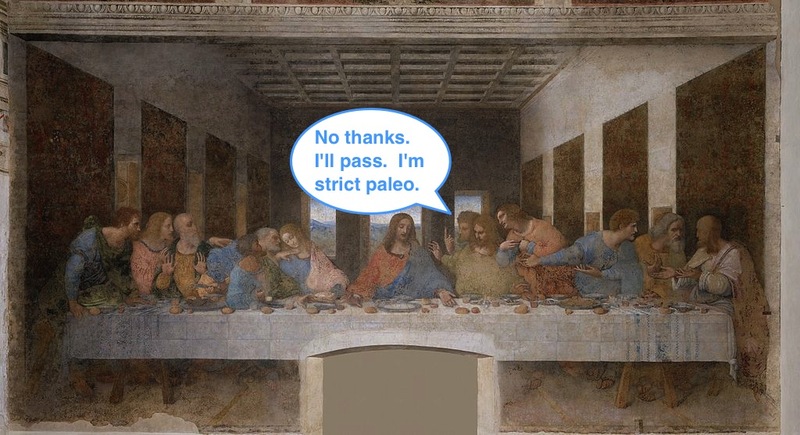 I’m strict paleo.”) And when He reigns again in full glory His followers will share in the marriage supper of the lamb. Starvation, obesity, allergies, intolerances, eating disorders and degenerate tastebuds are a consequence of The Fall and taint all humanity’s relationship with the food God called good. Yes. Man’s relationship with food has been complicated ever since. God could have created people to receive nutrients like plants. Just soak up some sunlight, put your feet in mud, the nutrients will be absorbed and you’ll be good to go. But no. We have to work a little harder for it. As a mom and a wife, I have the privilege and joy (okay, sometimes drudgery) of preparing meals for my family. Fortunately, because what we need for nutrients can be presented on a plate, stick, bowl or cup in any number of ways, I can use artistic license and creativity in preparing meals. Cooking is a creative outlet. Our travels have exposed us to spices, herbs, fruits and vegetables we would not have had the inclination to try at home. Now I cook and experiment on my very willing guinea pigs – a husband and our children. Dining with people of other cultures and eating the food they have prepared shows respect and brings honor to Jesus, who we represent. It has opened our eyes to aspects of His character we did not appreciate before. As I prepare meals in my kitchen, I recall with thanks those experiences, praise God for His abundance and toss in a dash of garam masala. This year I will be featuring several recipes inspired by our travels. These recipes are generally quick, cheap and easy, and can be tailored to fit your family’s tastebuds, degenerate or otherwise. Next Post Brussels Sprouts? Who serves THOSE to guests?